Hi ladies!! How are you all? Today I have swatches of three Clinique Chubby Sticks that I hauled in my last trip to Hong Kong. I absolutely LOVE my Chubby Sticks!!! They are without a doubt my product of the year. I searched high and low in HK to get these and I'm so happy I managed to pick my favourites up. The ones I'll be showing you today are Woppin Watermelon, Super Strawberry and Mega Melon! For the uninitiated, Clinique Chubby Sticks are a chunky lip crayon that give a sheer tint to the lips. 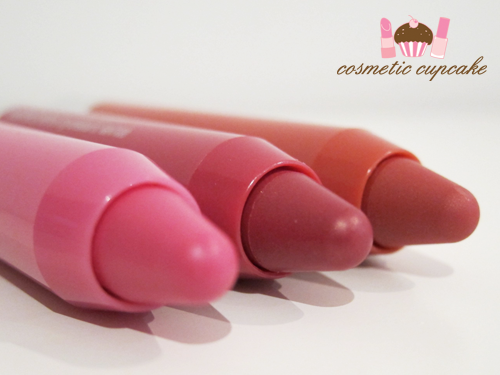 They contain Shea Butter, Mango Seed Butter and Jojoba Seed Oil and feel wonderful on! 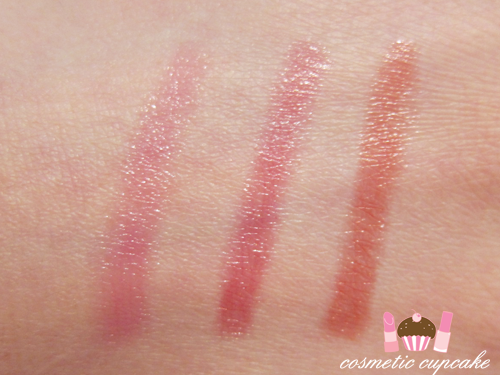 I reviewed another shade Whole Lotta Honey earlier and you can read the full review here. 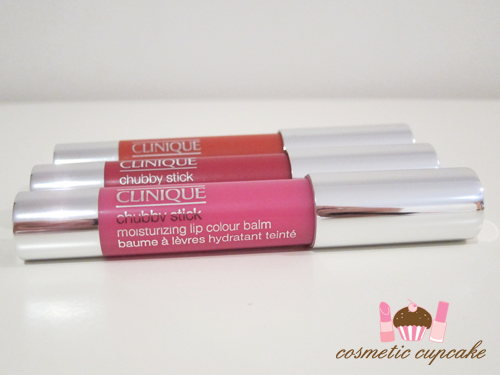 Clinique Chubby Sticks in Woppin Watermelon, Super Strawberry and Mega Melon. Woppin' Watermelon is a very sweet medium pink shade and is my favourite. It goes with everything and is so foolproof you can apply it without a mirror! My lips are pretty pigmented so it gives me a nice pinky tint. Super Strawberry is a sheer crimson red shade. Great for a light pop of red when you don't want something too out there for eg. work! Mega Melon is a warm brick red shade and is quite unique in my collection. Details: Clinique Chubby Sticks are available in 8 shades. They can be purchased from www.clinique.com.au and Clinique counters Australia wide for $35. David Jones currently have Gift With Product (GWP) so with any purchase of over $60 you receive a nine-piece gift set! 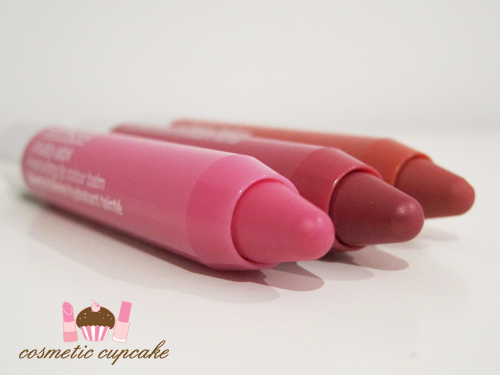 What can I say but that I ♥ them =) Have you tried Chubby Sticks out? I also have Chunky Cherry to swatch for you all later too! I LOVE MY CHUBBY STICKS SO MUCH. But I still chortle when I have to say the name. BUt Elmo singing is very annoying!!! they looks amazing on you!!! Hmmm...after all the great reviews, and your mention of a current GWP....I might have to try a couple of these out! I just feel so apprehensive about the crayon packaging because I keep thinking that it has to be super pigmented like a crayon! Ooooh these look lovely indeed! I love the colours you picked, especially the Super Strawberry one! I love the Mega Melon one, it's so cute!